I’ve been doing a lot of chipping and putting this year. Considering my recent history (two spine surgeries earlier this year), that’s about all I’ve been able to do. I have learned a good bit about each stroke, and have gotten much better at each than I ever have been. What’s important, I’ve found, is how you practice. Of course, you have to learn the shots. That takes hitting lots of putts and lots of chips. Go ahead and do that. Remember, though, that applied chipping and putting comes as a package deal. The chip and the putt work together in a partnership. When you play, you hit the chip, then you go putt it out. That part needs to be practiced, too. So after you’ve practiced putting for about fifteen minutes, and after you’ve practiced chipping for fifteen minutes, practice them together. Get four balls and chip them to the same hole, but from different locations around the practice green. Then go putt out the four balls. When you get up and down on all four, reverse the drill. Chip to four different holes from the same location. After you have done that, narrow down the drill. With one ball, chip it and putt out. Pick a different location and a different hole. Chip and putt out. Keep doing this for dozen times or so, giving yourself a different shot every time. Never hit a do-over chip. Learn to deal with the putts you leave yourself. It’s one thing to have good technique. It’s another to know how to get the ball in the hole. If you don’t have a lot of time to spend around the practice green, then do only that. 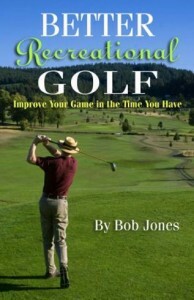 Bobby Jones’s most famous book is titled, Bobby Jones on Golf, and has a deservedly sterling reputation. It is a compilation of selected columns that he wrote for syndication to daily newspapers from 1927 to 1935. 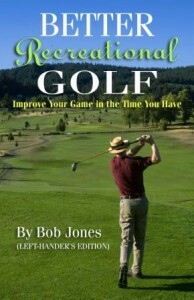 A book he wrote later, as a book, titled, Golf Is My Game, is equally rewarding. The instruction portion is more to the point in many places, and reads as a unified piece of instruction rather than a collection of thoughts on various subjects. 1. I must be prepared for the making of mistakes. 2. I must try always to select the shot to be played and the manner of playing it so as to provide the widest possible margin for error. 3. I must expect to have to so some scrambling and not be discouraged if the amount of it happens to be more than normal. These admonitions come at the end of an extended section where Jones explains that in an average round (for him) of four to six under par, there would be only one or two shots “that had not been mishit to some degree,” and in his best rounds, only five or six. 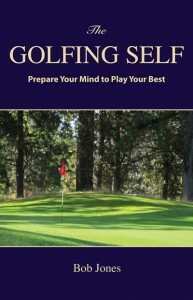 By keeping expectations reasonable and accepting the course and the playing skills you bring with you that day, it is entirely possible to become someone who always gets more out of his or her skills than would seem possible. What more can any golfer do than that? I suspect that most recreational golfers feel comfortable playing into a green from under 160 yards, maybe as far away as 170. I also suspect they feel all right playing shots of about 200 yards or longer into fairways. That 30-yard gap in the middle, however, is the problem that many of us have yet to solve. If we face a shot from within that gap, we’re trying to hit a green. Not many of us can hit a green reliably from that distance. It’s not just us, either. Touring professionals have a gap as well. It’s just that their numbers are different than ours. There’s a chart in the book, The Search For the Perfect Swing that shows the percentage of greens hit, from which distances, in a professional tournament in England in 1964. The data show that the percentage of greens hit from 150 to 180 yards was fairly consistent at 75-80 percent. At the 190-yard mark, the percentage of greens hit dropped to below 50 percent. Remember that in those those days that they hit to 180 yards with a 4-iron. So at some distance, there’s a sharp drop-off for everyone, and it’s sharp. What do you do about it? 1. Learn to hit the long clubs straighter. Obvious on paper, but pretty difficult to do in real life. If the pros can’t do it, we can’t either. Let’s try something else. 2. Sharpen your short game. This is better. You’re probably going to miss the green from such a distance, but if you can get up and down you’ll be O.K. 3. Lay up. If there is real trouble around the green, bad trouble, it’s a losing bet to think you can avoid it from a long distance. Play short of it and trust your greens game (chipping and putting). By real trouble, I mean water, and bunkers, especially if you’re not a good bunker player or they’re deep and plentiful. You might take four shots to get down from the fairway following this strategy, but if you can guarantee that, it’s better in the long run than trying for three and most of the time taking five or six. Recreational golfers should emphasize 2 and 3. These are two ways to play within the capabilities you now have and that you can likely attain to. I don’t mean for you to play timid golf, and this isn’t doing that. It’s getting the most out of the game you have and not asking more from it that it can deliver. What do you do when you have a shot that falls inside your distance gap? Post your solution in a comment below. The Big Dog gets you in trouble sometimes, and you have this nagging feeling every now and then that you shouldn’t be using it. How do you decide which times those are? These four questions can help. First, be honest and decide what score you expect to get on this hole. Then go down the list. At the first No, leave the driver in the bag and hit something else off the tee. 1. Is your expected score on this hole a par? 2. Think of the longest club you feel confident about hitting into a green. Will your average drive get you to at least the distance from which you can hit that club? 3. Do you need to hit a driver to have a short iron or less into the green? 4. Think of the trouble off the tee. If you hit into it with a driver, can you still make one stroke over your expected score with average play? Here’s how this works out in practice. There is a hole on a course I play several times a year, 386 yards uphill, par 4. In the nearly twenty times I have played this hole, I have parred it twice. It’s an easy bogey for me, but a hard par. A perfect drive (what’s the chance of that?) leaves me with a hybrid club off an uphill lie to hit the ball onto the green (what’s the chance of that?). The answer to question 1 is No. I don’t expect to par this hole. I play a hybrid club off the tee, advance the ball with a 6-iron, pitch on, and get my bogey. Keeping the driver in the bag lets me hit three easy shots into the green instead of two hard ones. Double bogey never gets put in play, and there’s an outside chance of making par if my chip gets close enough. The very next hole, on the same course, is a 391-yard par 4. It’s longer, but I always use a driver. Why? Par is a reasonable expectation for me here because the fairway slopes downhill, making the hole play shorter, and angles to the left, favoring my shot shape (question 1 is Yes). Catching the slope will leave me with a short iron into the green. (question 2 is Yes). Question 3 is Yes; a shorter club off the tee will leave me with a mid-iron to the green. As for question 4, the trouble on the right is easy to play out of. Sometimes I have made par from there, so the answer is Yes. Out comes the driver. You don’t have to use your driver just because it’s a par 4 or a par 5. Make that club work for you when it’s to your advantage. Otherwise, try a different option off the tee. Slow play is everyone’s bugbear. Well, maybe not for the slow players. But to get around the course in less time, you don’t have to play faster. You only need to play more efficiently. This is what I mean. Say your group is at the tee. One member is on the tee box, teeing off. The other three members are standing way over there by their carts. The one guy tees off, and the next one up walks up to the tee box, goes through a routine and hits. Then the third member walks over to the tee box and so forth, and finally the fourth member walks over and hits. The first member is on the tee box and the second member is standing beside it. The first member hits, and right away the second member steps onto the tee box and the third member walks up to it. The second member hits, the third member walks on the tee box, and the fourth member walks up to it. The third member hits, and the fourth member steps on the tee box. And hits. Can you see that the second version could easily save almost a minute in getting the foursome off the tee? Multiply that by 18 and you get a significant saving in time over the course of the round by doing just that. No one had to hurry. No one had to rush. It’s just that the entire group played more efficiently. That’s all. Everyone doing a little thing added up to a lot of time saved. That is the faster play strategy. From the fairway, when someone is hitting and you’re next, you can begin surveying your shot at the same time the other player does. (Out of courtesy, don’t pull your club until the other ball is in the air.) In other words, be ready. On the green, read your opening putt as soon as you get there instead of waiting until it is your turn. Mark your ball, clean it, and put it back down unless it’s in the way of someone else’s putt. That way there’s no waiting when it’s your turn. I watch the four old guys ahead of me get on and off the green in a hurry, and this is how they do it. Just doing those three things could save close to an hour over eighteen holes. That is, if you can convince your buddies to give them a try. It all comes down to this. Paying your green fees does not give you the privilege of holding up your group and the the groups behind you by playing at any pace you choose. By giving back a bit of what we think we might be entitled to, everyone benefits from the overall goodwill that’s created. Playing efficiently is a painless way to do it. Can you think of some others? Post them in a Comment below. 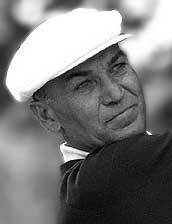 For those of you in the Ben Hogan fan club, today is your day. It is the 100th anniversary of the Master’s birth, in Stephenville, Texas (about 60 miles SW of Fort Worth). Hogan is the ultimate self-made player, winner of five U.S. Opens (the Hale in 1942 counts), numerous other major titles and PGA titles, and probably the most iconic golfer of all time. There is so much to be said about him, that I don’t know where to begin, and you probably know all of it, anyway. I’ll just let some famous pictures do the talking. 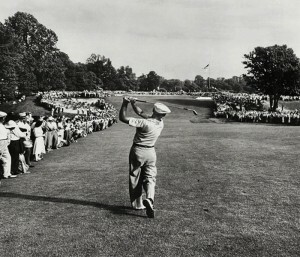 Hitting a 1-iron into the 72nd green at Merion in 1950. Photo by Hy Peskin. 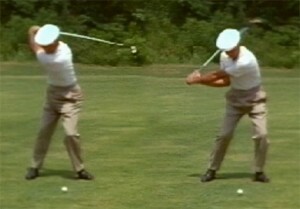 The Hogan downswing from the Wonderful World of Golf episode in 1965 where he hit every fairway and every green. Though the golf course management may not contravene any Rule of golf on its own, if a local condition interferes with the proper playing of the game, it may modify a rule with the approval of the USGA. Local rules are shown on the back of the scorecard and should be read before you start your round. You might find things like identifying particular objects which can be treated as immovable obstructions. Special areas where the operators do not want foot traffic or balls to be hit out of might be designated as an area from where a free drop may be taken. Some courses have power lines running low across a hole and say what to do if your ball hits one (generally, play another from the same spot without penalty). Special drop zones might have been set up on certain holes for certain hazards. Special drops might be awarded for the protection of young trees. If there is habitual temporary wetness, a special procedure can be established. The meaning and location of stakes marking water hazards and out of bounds may also be described in the local rules section. Note especially if there is an out-of-bounds area within the perimeter of the course. If a hole borders the practice range, expect the range to be marked as out of bounds. Read the local rules on the back of the scorecard. They are there to help you play better and take care of the course for the golfers who come after you. O.K., we’re going to get this shot down, once and for all. The pros say how easy it is to get out of a greenside bunker and you still can’t do it. Following a great shower of sand the ball is still sitting there, two feet in front of where it was, or else it gets picked clean and takes off across the green like a bullet. 1. Take out your sand wedge and open the clubface until it is almost lying flat on the ground. Really open. Don’t worry about how open that is. I watched Kari Webb do this in a practice bunker and couldn’t believe how much she had opened the clubface. And how easily she made the ball pop out of the bunker. 2. Align your stance about twenty degrees to the left of the pin. 3. 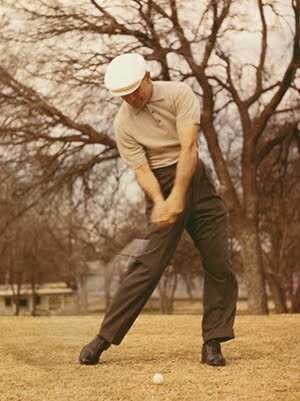 Swing with your hands and arms as in your normal golf swing, along your stance line (and not toward the pin), but keep your lower body as still as you can. So far, so good. Now for the magic ingredient. 4. 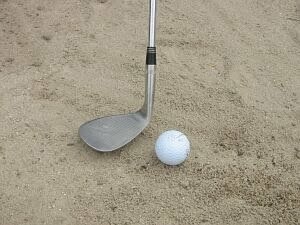 Swing the club through the sand as if you were going to slide the club underneath the ball without touching it. You could do this if the ball were sitting on top of 3-inch rough. Think that you’re going to do the same thing here. The club slides through the sand on its sole, the part that is primed for the task because of how much you opened the blade when you set up. 5. Practice. There has to be a range near you with a practice bunker. If there’s high grass around the bunker, swing through the grass a few times to get the idea of sliding the club through a medium, then step into the bunker and do the same thing. This shot is like learning to ride a bike. As soon as you learn how to do it, it’s easy. It really is. Three of the four major championships of golf are played on old, familiar courses. The Masters is always played at Augusta National, of course. Traditional courses are getting the U.S. Open once more, and the British Open has a set rotation of venerable links and parkland courses. It takes the PGA Championship to break new ground. The PGA will be played this year at the Ocean Course on Kiawah Island in South Carolina, near Charleston. The black tees stretch out to 7,873 yards, but the PGA will be played from 7,676. You won’t find the short par 4s that the USGA loves so much anywhere in sight here (maybe). In fact, let’s just be up front about it. This is a really, really hard course. Really hard. 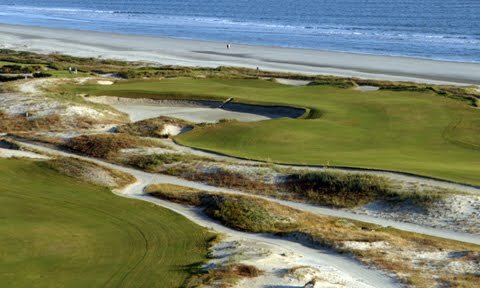 The first nine holes of the Ocean Course lie a few hundred yards away from the surf. The back nine is right against it. Ten through thirteen are a fairway’s width away, and fourteen through eighteen are hard against the beach. Prevailing wind? Forget it. It will blow from any direction it wants to and switch at any time. The Pete Dye design tries to lure players in playing shots they really shouldn’t be hitting. On number two, a par 5 that is almost a right-angle dogleg to the left, the more of the marsh you cut off, the shorter your second and the better the look at the green, but you’d better make the carry you planned for off the tee. The par-5 11th is designed to make it look like you should go for it in two, when you should really try to make your birdie by laying up. The 12th, on the card at 415 yards, can be shortened, due to Dye’s trademark runway tee boxes, to 300 yards. It would be an intriguing challenge, with failure not an option. Fairway bunkers are now in the modern player’s landing area, about 330 yards off the tee. Given the course’s length, there will be no laying back with fairway woods or long irons to avoid them. The PGA is supposedly the weak link in the modern majors family, but I don’t think so. It has the strongest field, is played on tough, modern courses, and while it has had a few flash-in-the-pan winners, its roster of champions lacks only Palmer and Watson. The weather forecast as of this writing is for temperatures in the mid-70s, a welcome break from the 90s and 100s which frequently plague this tournament. That’s the good news. The bad news is that showers and thunderstorms are possible each day. It could be a mess. Who do I think will win? I’ll try to extend my perfect record in predicting winners of the majors this year (0 for 3) and go with Jason Dufner or Robert Garrigus — two guys who hit it awfully long and have been playing well this year. For me, this tournament signals the end of the professional golf season. College football starts three weeks later, and the FedEx Cup never has, and I imagine never will, capture my attention. Just asking while the question is topical: Four years from now, when the summer Olympics* are held from August 5-21,** when will the PGA Championship be scheduled?